Beautifully engraved SPECIMEN certificate from the A.G. Edwards, Inc. This historic document was printed by the Security-Columbian United States Banknote Company in 1883 and has an ornate border around it with a vignette of an allegorical man infront of the United States. 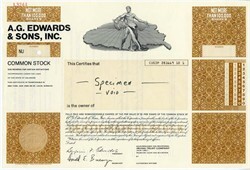 The certificate has the printed signature of the company's Chairman, Benjamin F. Edwards III. 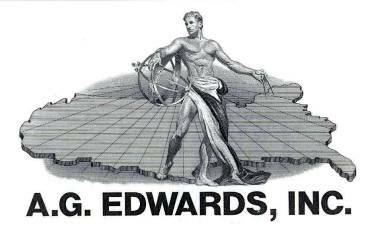 A.G. Edwards, Inc. was an American financial services holding company; its principal wholly owned subsidiary was A.G. Edwards & Sons, Inc., which operated as a full-service securities broker-dealer in the United States and Europe. Firm was acquired by Wachovia Securities, which later was acquired by Wells Fargo Advisors. The firm provided securities and commodities brokerage, investment banking, trust services, asset management, financial and retirement planning, private client services, investment management, and other related financial services to individual, governmental, and institutional clients. A.G. Edwards was a member of the New York Stock Exchange and other major stock and commodities exchanges. The firm's global headquarters were located in the Downtown West area of St. Louis, Missouri. The company traded on the NYSE under the ticker symbol AGE.